In Foucault's History of Sexuality, he looks to Greek sexual practices to make a distinction between two forms of ethical discipline. The first thinks of morality and ethics as a matter of interdictions, judgments, and transgressions. This conception of ethics is essentially juridical: a set of laws or rules that organize behavior according to principles that one ought not transgress or that one ought to live in accordance with. To do the good, to live well, is conceived in terms of more or less rigid moral laws that are policed by the appropriate moral authorities: usually a clergy of some sort who has access to the true meaning of a sacred text and uses that text to diagnose pathological or degenerate behaviors. The goal of this sort of ethics is to identify deviations from the good life and to reform those deviations. The second form of ethical discipline is less interested in transgression and reform and more interested in managing the body to produce health. Foucault calls this way of thinking about ethics "dietetic" instead of "juridical," and he finds this to be the dominant way of thinking about sexuality for the Greeks. It conceives of the work of ethics as a project of integrating the various aspects of the self into a flourishing whole. The example that Foucault treats is sexuality. A dietetic approach to sexual pleasure would take the problem of sexuality as one of how to integrate this pleasure within the rest of the activities of life. A juridical approach to sexual pleasure would take the problem of sexual ethics to be a question of how to diagnose deviant forms of pleasure and reform them according to a transcendental sexual norm. Obviously, important philosophical issues are at stake. Foucault finds resources in the Greek dietetic approach to sexuality for rethinking his own relationship to sexual pleasure, transforming the dominant ethical concepts from deviancy, transgression, and reform to concepts like moderation, integration, and health. This is a powerful reimagining. It demonstrates once more that the value of philosophy is less in determining the truth of a particular point of view and more in the discovery of new (or at least forgotten) concepts for analysis of the activities of life. My love of philosophy does not stem from a desire for truth, or a love for getting things right. The attraction of philosophy--the pleasure it gives me--is the chance it gives for seeing the world from new and original angles. The best philosophy books open a range of new intellectual perceptions. Every concept, every distinction, is a chance to encounter the world again. I think it is easier for runners to understand the dietetic form of ethics that Foucault describes. While we sometimes rely on the notion of rule, law, and transgression in describing intelligent running and training, we more often thematize running and the pleasures, difficulties, and problems it gives us in terms of how to integrate them into a larger life. Running teaches us to look at our bodies and the pleasures and pains they produce in terms of an ethic of self-care. We learn to read our bodies and to think of our training, our running actions, in terms of how they contribute to our psychological and physical health. The good forms of running are the ones that make us faster or happier. The bad forms are the ones that cause us to suffer needlessly or that get us injured or perhaps distract us from more important activities. We treat running, in short, as an ethical practice, not as a moral code. We don't usually ask whether it is right or wrong to run in a certain way. We ask how we can keep doing it, how we can get better at it, and how it either helps or stymies our other life projects. We treat running, in short, pragmatically--without the stigma of ethical or moral judgment. Interestingly, there seems to me to be little relationship between practicing a dietetic ethos as a runner and taking up that sort of pragmatic approach to ethics in the rest of life in all of its political, religious, and familial relations. Runners seem to me, actually, more judgmental than the general population, but perhaps this perception comes from the fact that I interact more intimately and directly with runners than with other sorts of folk. What if we were able to look at the rest of our moral and ethical lives in this way, in pragmatic terms instead of juridical terms? What if the good of religious practices or sexual practices or business practices were understood in terms of their effects on the quality of life instead of in terms of "moral" concepts like greed, evil, perversion, or abnormality? How are we able to attain this sort of relationship to our action in running, but not in relation to other activities? Is it because running doesn't matter that we treat it with an intelligence that is deft, free, and lighthearted? If so, what are the implications of that for confronting more difficult problems? Finally, is the dietetic approach really as admirable as it seems? Isn't this an approach that is easier to market, to institutionalize, to "gadgetize." Running blogs (like this one), running logs, Garmins, heart rate monitors, training plans, Weight Watchers, massage therapists, sports medicine, and even barefoot or minimalist footwear play to the dietetic ethos. We are always trying to maximize the experience of running in some way--and there are a million different ways to do it, most of them with marketing plan attached. There is no right or wrong way to run--to each his own. But the flip side of this is the proliferation of a multitude of ways to run, complicating the endeavor and multiplying the gadgets that go along with it. 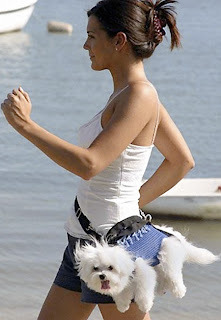 The dog-fanny pack: an accoutrement for every lifestyle. Most of us are minimalists and maximalists. Hobbyjoggers and dedicated racers. Purists and techno-geeks. This is the way the capitalist system wants us: consumers of every possible lifestyle, followers of every kind of ethos. Non-judgmental, fluid, practical, experimental and on a quest to maximize everything at once, including our lines of credit. Makes you want to draw the line somewhere--and judge those who cross it. As usual, thanks for the brain food. Hey, thanks Bonk. Just got back from a philosophy conference, so I am brimming with 10 cent words. Glad you enjoyed it. Actually, I think that the gizmodification of running is a direct link to a more juridical approach, rather than dietetic. An HRM tells you exactly when you have crossed some pre-set value. It neither knows nor cares where that number comes from. You have violated a preset condition, and it is now telling you this. So what if you feel good? It doesn't matter one bit to the device, the plan, the log, how you feel, or how your mood or mental state may have both impacted and been impacted by your running that day. They are disconnected from the "you". Sometimes we need that disconnection. That's why coaches are better at telling an athlete to take a day off than most athletes are at telling themselves to take a day off. But even with that physical disconnect, the coach has to know the athlete and his/her performance intimately to be able to make an accurate assessment. From my viewpoint, most runners nowadays, are of the judicial mindset than the dietetic. It's not about how to fit running into an overall whole, but how they can meet some randomly determined goal. Hey Scout, thanks for your thoughts. My first impulse is to agree with you, but I guess I wanted to resist the idea that the dietetic approach is necessarily better. There is something about the disconnect of the juridical that allows for reflective distance--as in your example of the coach. The integrative approach of the dietetic allows for more intimate and holistic modes of interaction, but for this very reason this form can be stifling. Having both modes of evaluating in your conceptual toolbox seems to me the best way to go. Concepts are like any other tool: their effectiveness, their truth, is dependent on the problem they are employed to solve. I agree with you; one needs both to have a "complete" (or at least a more complete) picture of oneself. I think that the issue I see is leaning too heavily in one direction or the other, which is an all too common thing these days. And of course, I see most people leaning too heavily to the juridical, which is probably as much my own personal prejudices as anything else. I agree that neither is necessarily better than the other, and that each has its place within the toolbox. The ability to detach from oneself is just as important as the ability to be deeply connected and understanding of oneself. The person who can learn both has learned mastery over the self. I do think that we as a society, as a culture, tend to lean towards the juridical these days; there is a lot of talk about healthy living, but it always seems steeped in some sort of judgment about what is "right" or "wrong", and less about what is good for us as individuals and as a society. Our self-worth seems to be based on images that represent ideals of "good", rather than on a healthy understanding that we are individuals with our own unique traits.